Now that Fall is coming I want to share one of my favorite kitchen hacks. I am always looking for ways to eat more vegetables but often, especially on week nights, I do not feel like taking the required time to prep and cook them. I want something simple and tasty. The solution? Cut them up and throw them onto a baking dish then season them with salt, pepper, and any other herb or spice your heart desires. Sprinkle olive oil over the whole thing, shake the pan to evenly distribute it so they are as close to one layer as you can easily get, and throw it into a 425-degree oven for about 20 minutes, taking them out to stir and redistribute on the pan halfway through. It is the perfect side dish to just about any meal. And often I will take a serving, cover it with cheese, melt it under the broiler and call it dinner. It never fails. My favorite combination these days is red onion, broccoli and mushroom. When I want to change it around some I will add red peppers, use cauliflower instead of broccoli, or add a few cloves of garlic. It is good with a little balsamic vinegar splashed on just before serving and sometimes I will even dress it in vinaigrette if I have any leftover from salads. The only thing I keep in mind is to cut the vegetables as close to the same size as possible so they will cook evenly and to use vegetables that take about the same amount of time to cook to the desired consistency. 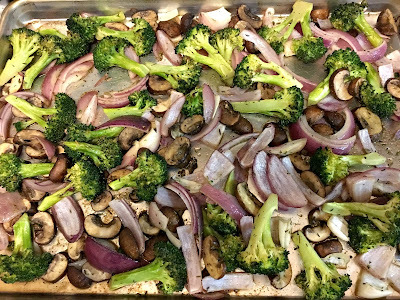 The broccoli takes a little longer to cook than the onion and mushrooms but I like it a little on the crunchy side and I like the onions and mushrooms to be a little more done so it works out perfectly. No recipe here, just a tried and true technique. Prepare and chop desired amounts of broccoli, cauliflower, onion, mushrooms, red peppers, and fennel. Spread evenly on a large baking sheet. Season to taste with salt and pepper and desired dried herbs and spices such as thyme, oregano, cumin, coriander, dried chilies, or paprika. A favorite curry blend is also nice. Pour just enough olive oil over the vegetables and spices to coat them and stir them around on the baking dish so they are all coated and in as even a layer as you can get them. Bake for about 10 minutes. Remove from the oven and gently stir them around to redistribute the layer. Return to the oven and cook another 10 minutes or so, until they have reached the desired consistency.